In a natural progression from the author's earlier work, "The Straight Lead: The Core of Bruce Lee's Jun Fan" "Jeet Kune Do", Teri Tom takes some of the basic mechanics and strategies covered in that book and applies them to the rest of the Jeet Kune Do arsenal. Bruce Lee's protege' Ted Wong has referred to Teri as 'his top student'. 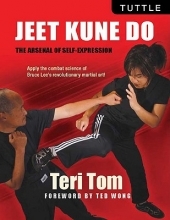 In this book, Teri Tom presents many details that Wong observed during his time with Bruce Lee, and also describes his research into the how and why of Jeet Kune Do techniques.